Axis Of Oversteer: Expensive Stripes. Option PNT6 on the Ferrari 599 GTO order sheet, "Historic GTO Stripes" runs a cool $9500 with tax but don't worry, if you haven't bought an F40, a couple of Scuderias and at least one Enzo in the past you are not going to get your mitts on one, even if you could. 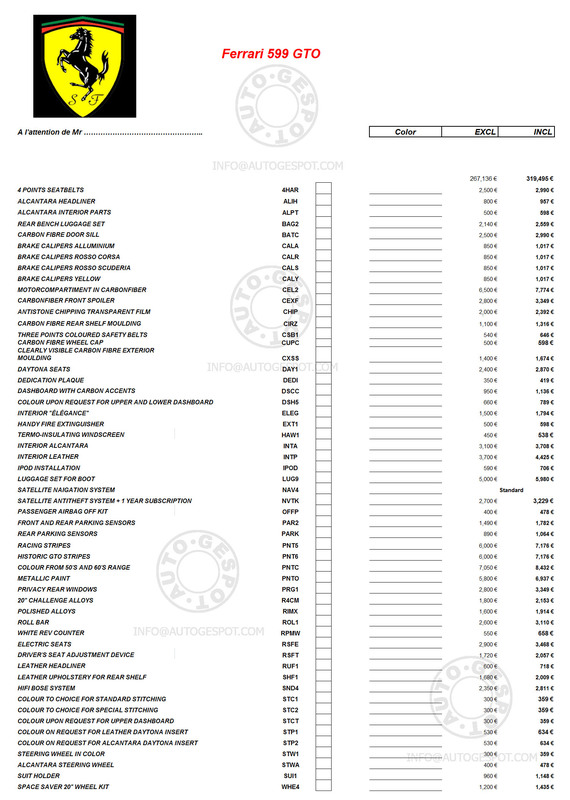 Autogespot , the ones who first published that dodgy white GTO picture that has been making the rounds and claimed as an exclusive here and there now have gotten a hold of what purports to be an order sheet for the car. Check it out, what options would you add? I'll take mine with aluminum calipers, alcantara everywhere I can get it, 4-point belts, whichever wheels are lightest, the roll bar, and a "Handy Fire Extinguisher." Is it me, or do the options seem considerably cheaper than what Porsche charges? Dear Dude/Blog Owner— That banner pick is a classic. Is that Melbourne 2006? Where did the image file come from? Can I get an original? PS- I really, really like the way you so carefully integrate your logo.